Bistro Moore is one of those restaurants that I fall in love with as soon as I step through the doors. I love the warm unforced greeting from the waitress, the brown and white interior that's cosy without being too intimate, so it's perfect a couple's dinner or for a big table of girl friends, both of which we see tonight, the enormous vintage posters of Bally and Orangina on the wall that make it feel like a bistro but like the waitress, it's unforced and unpretentious. It has a chef's hat because it's about real Italian food - the love of my life. There's olives and luminous green olive oil on the table, with rolls and crostini. The menu is short, maybe five options for each, which I'm a big fan of. It looks like intelligent rustic food, not modern or wanky or with a twist of something it's not. We have prosecco and a bottle of nice Margaret River red (super wine list). I choose the special of egg fettucine with parmesan cream and sliced black truffle (all pasta is homemade, maybe there is a god?) 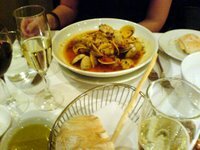 and N the beautifully spiced vongole. 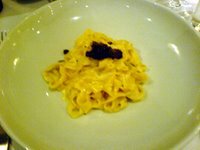 The pasta is pure delight - the cream just textures the fettucine and there's just the perfect amount of earthy truffle. 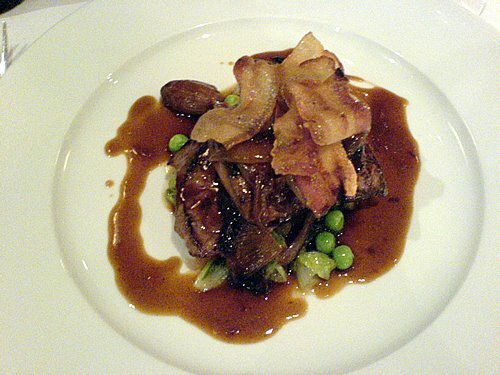 Our mains are seared calf's liver with peas, sauteed onion and cos lettuce, and crispy pancetta, and parmessan and bottarga crusted fish on zucchini puree. Mine is superb, albeit lukewarm (the only minus to the whole evening) - the waves of crispy pancetta contrasting with the creamy pink liver. We are in such a good mood (and getting tipsy with the first red wine of the year), and order dessert: affogato for N and semifreddo with butterscotch pistachios for me. They are faultless. This is a place I want to come back to many more times. We also tried Dragonfly and Sapphire Blue afterwards, both non places IMO and can easily be ticked off the list. Fantastic summary of the night. looks wonderful! and love your new photo--you look gorgeous!